Ever wondered where your YouTube vids are most popular? Google has announced a new metrics tool for YouTube users that will allow them to view detailed statistics about the videos that they upload. Called simply YouTube Insight, the tool is available to all YouTube users, partners and advertisers and can be accessed via the ‘My Account’ page, by clicking first on ‘Videos, Favorites, Playlists’ and then ‘About this video’ to the right of the listed videos. 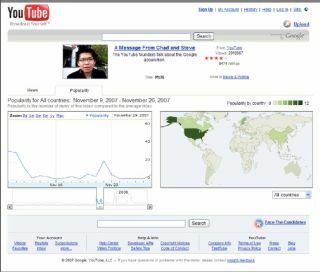 From here, users will be able to see a world map displaying the density of views for that video. Parts of the world where the video has proved popular are shaded darker, with less popular parts coloured lighter. To the left of the map there’s information about the number of views per day, which highlights ‘spikes’ in views. Unfortunately, YouTube users are only able to access Insight data for their own videos at present, but it’s still a pretty nifty little tool – if only for a bit of an occasional “I’m big in Japan” ego massage.